The mascot at my school is a leprechaun by the name of Lenny. St. Patrick’s Day is known as Lenny Day at my school and it is a BIG deal. Like many leprechauns, Lenny has been known to make a mess. (If you’ve never been in an elementary school on St. Patrick’s Day you are really missing out.) I was out last year on Lenny Day and my students were concerned about what might happen so one of them wrote this note and taped it to our door. I was inspired. 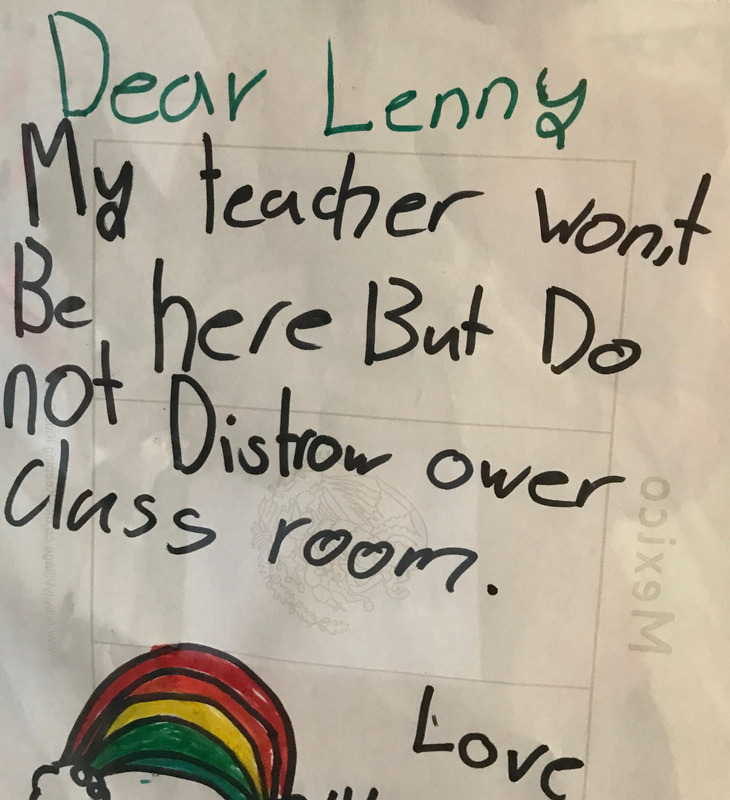 If an 8 year old could stand up to Lenny, which is like standing up to Santa or the Tooth Fairy, surely I could stand up when needed. 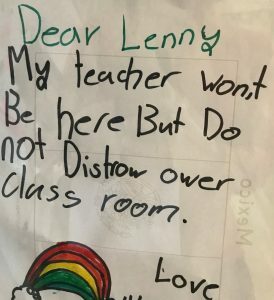 This kid knew that Lenny would cause trouble, that what Lenny would do would not be best for us, so this kid took a stand. Educators have to do the same thing. We have to identify the things we are doing or being asked to do that are harming children and stand up and say no. To our bosses, to parents, to legislators. Equally as difficult, or possibly even more difficult, we have to keep teaching children in a system that we are fighting. We have to keep putting students first. We are living in a society of racial and socioeconomic discrimination and oppression. It is far bigger than just our schools, but our schools are a part of that system. Recognizing the racial and socioeconomic discrimination and oppression that is systemic in our society and our schools is critical and is a lot to face and to carry. In spite of that we have to have the courage to keep teaching children. To keep teaching them in spite of the fact that they are living in a system that does not want them to succeed. We have to keep working to give them the skills and knowledge they need to succeed. And to work towards a better, more equitable society.